Melt pump plays an indispensable role In the extruder. It can not only stabilize the melt conveying material, can also provide more effectively than the screw extrusion pressure, and it can be used as a mixing device, used in order to improve the quality of melt. As the extrusion machine is the "friend", the production of melt pump can accurately control head. Melt pump is composed of two gear, usually driven by a single motor, delivered by the extrusion screw materials first enter the suction end of the gear, slewing gear and then sent from the other side. The principle is made, the gear has a profile of very fine, when the gear and the shell close together, the amount of material in each tooth is very accurate. Gear end of accurate measurement of the material in the material, the gear rotational speed is controlled by the DC or AC motor drive, the change rate is less than 1%. Why is the extruder melt pump "friend"? 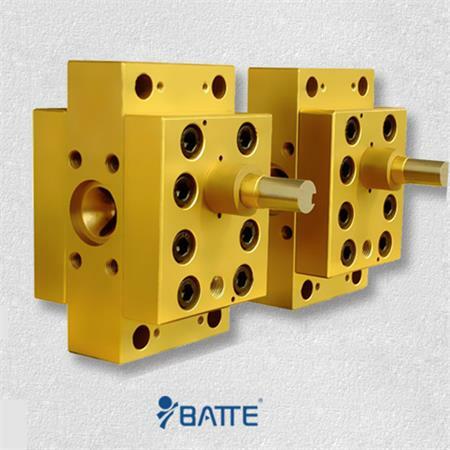 This is because, through the precise control of output volume of melt, melt pump can eliminate the influence of the extruder output stability of many variables. Melt pump can affect many unfavorable factors to compensate the output result, such as temperature control is not good, the feeding interruption, polymer blend composition changes (such as recycled content change), as well as screw design precision caused by fluctuation of extrusion. To solve these problems with the stability of output, the operator can focus more on the head and downstream equipment. Monitoring of melt pump however, melt pump operation need to monitor their degree. 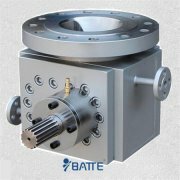 An important observation index include the outlet pressure, suction pressure, the pressure difference between inlet and outlet, the motor current, gear shaft seal and pump temperature. As the head of the flow changes with the outlet pressure, the outlet pressure is constant. In general, the outlet pressure fluctuations can not exceed 10psi (1psi=0.00689Mpa). Fluctuations are usually drive, motor technology personnel to adjust transmission parameters. If the melt pump serious wear and tear, can also cause this problem. The suction pressure changes in response to the changes of the extruder output. Although the main function of melt pump is to eliminate these fluctuations, fluctuation range it can control is limited. 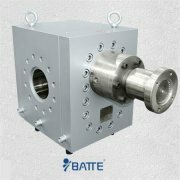 Even if the melt pump can maintain a continuous output of polymer melt temperature is constant, but can also be changed. Because in order to maintain the suction pressure is stable, the screw speed will change, causing the melt temperature fluctuation. The melt temperature fluctuations will directly lead to changes in the melt flow and the product size. The suction pressure fluctuation range not ideal than + 100psi + 50psi., it is if the fluctuation is larger than this value, will cause the nose flow change. To this end, the need to reduce the sensitivity of extruder motor response to pressure fluctuations. This usually by increasing the proportion of control and pressure detection bandwidth to extruder motor has the characteristics of. If this method is not the wave control to a minimum, it is likely that the extruder, so will have to make another analysis. Gear pump power required should be constant. Even if the drive current changes occurred in the course of a few amps, also means that there is a problem. 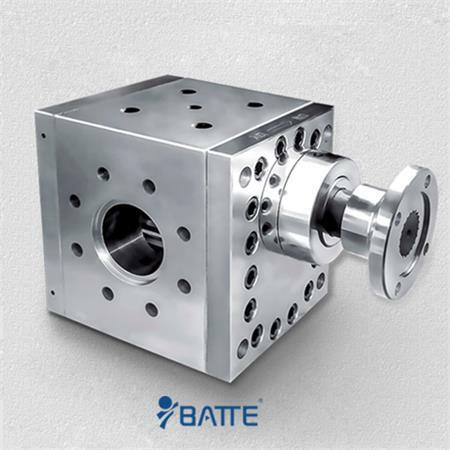 This may be an issue with a simple parameter, may also be pump, gear box and transmission shaft in the mechanical problems, or the suction pressure fluctuation is too big. Melt lubrication bearing melt pump is composed of the melt self lubrication, which is designed by leakage from the pump outlet to the suction side and runs through the whole bearing to achieve. Bearing fluid of polymer of protection is very necessary.